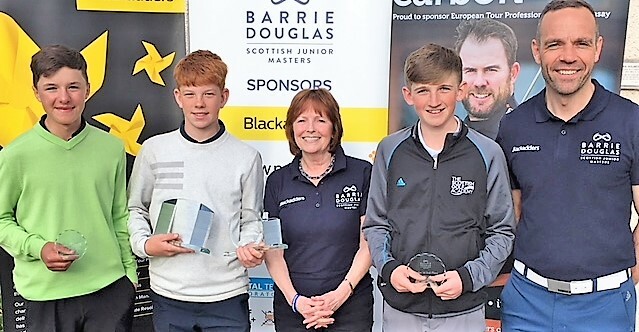 The inaugural Blackadders Barrie Douglas Scottish Junior Masters produced the tightest of finishes - two play-offs to be precise - at Blairgowrie Golf Club's Lansdowne course today. Jack Broun (Ayr Belleisle) and Greg Dalziel (Airdrie), last year's Scottish U18 boys champion, headed the Under-18s final stroke-play leaderboard, both matching the par of 216 for three rounds. In the two sudden-death play-offs to decide the age-group champions, Dalziel beat Broun with a 45ft putt for an eagle at the first extra hole to win the Under-18s title. The victory lifted Dalziel, the 2017 Scottish Boys champion, to the top of the Scottish boys' Order of Merit. Graham beat Scott, also at the first extra hole, to win the Under-16s crown. They finished only a shot ahead of Taylor Kerr (Thornhill) and Jack Gallacher (Bathgate) with the first-round leader, Andrew Thornton (Muckhart) finishing fifth on 218. The leading player from the North was Fraser Owenson (Nairn) who finished joint eighth on 222. Broun could manage "only " three birdies over his first 36 holes but he conjured up five over his final round of two-under-par 70 and he will be rueing a double bogey 6 at the third which, in the final analysis, cost him an outright victory. Dalziel, too, will be wishing he could play the last few holes again. Although he did birdie the long 17th, he bogeyed the 12th and 16th in his final round of 71. Gregor Graham had scores of 71, 70 and 75 to share the Under-16 stroke-play honours with Calum D Scott who had rounds of 70, 74 and 72. They finished three strokes clear of local player Cormac Sharpe. The dramatic finale was watched by Bradley Neil, hard on the heels of flying in from the Far East after missing the cut at the Volvo China Open 2014 Ryder Cup player Stephen Gallacher whose son Jack finished fourth after a count back in the U18 event. The tournament was held in honour of long-time servant to Scottish Golf and R and A selector Barrie Douglas, who passed away last year after taking ill while captaining the Scottish boys at the European Team Championships in Spain. Airdrie GC member Dalziel said: “This is one of my best victories and it was my first ever play-off. U16 champion Gregor was cheered on by fellow Blairgowrie member and close family friend Neil. Graham said: “It’s my best ever victory and doing it at my home club with the family supporting me makes it even better. 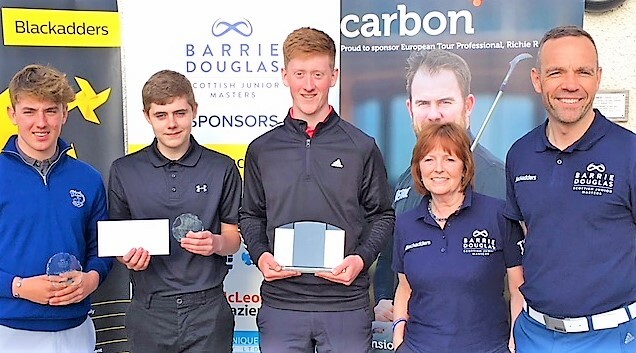 Tour star Gallacher, who is looking forward to his own Foundation’s event at Cardrona in June, welcomed a new world ranking points tournament on the Scottish junior calendar. He said: “The more competitive tournaments like this with ranking points at stake, with national selectors looking on, the more chance the kids have to perform and gain experience. 216 J Broun (Ayr Belleisle) 75 71 70, G Dalziel (Airdrie) 71 74 71 (Dalziel bt Broun at first hole of sudden-death play-off). 221 C Wilson (Castle Park) 73 75 73, S Logue (Royal Montrose) 73 70 78. 222 F Owenson (Nairn) 73 74 75, I Taggart jun (Lenzie) 70 76 76. 216 G Graham (Blairgowrie) 71 70 75, C D Scott (Nairn) 70 74 72 (Graham bt Scott at first hole of sudden-death play-off). 227 J McDonald (Torwoodlee) 78 73 75, C G Daun (Inverness) 75 78 74. 228 C Robinson (Turnhouse) 79 74 75, P Brown (Monifieth) 76 73 79.